Once you have your shirt and tie put together, you need to match your shoes to your suit. To do this, know that there are three main colors of dress shoe — black, brown, burgundy/oxblood — to go with five main colors of suit — light gray, dark gray/charcoal, navy blue, brown, black. 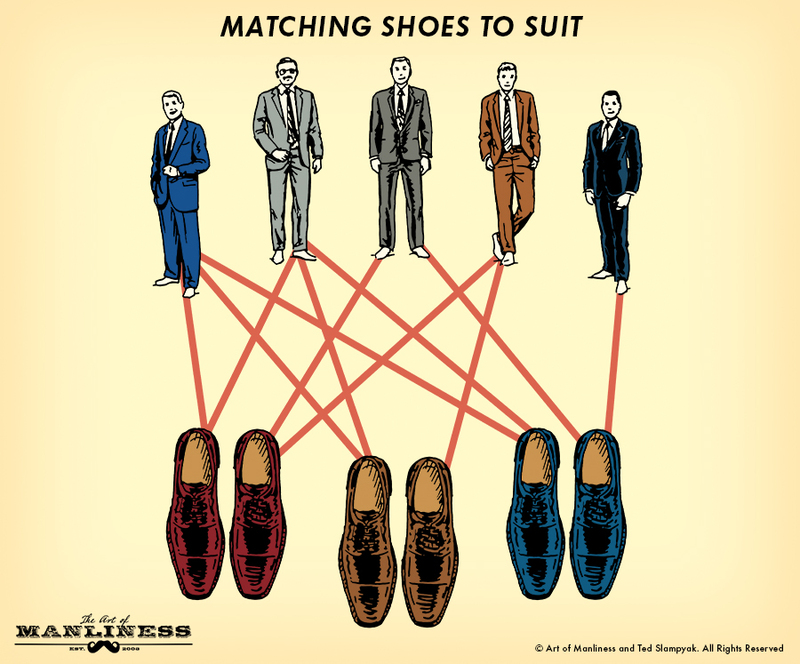 You can’t wear any shoe with any suit, so use the above illustration to help you make the appropriate selection. The only suits that go with every color shoe, and therefore are the most versatile, are navy blue and light gray. The least versatile suit — black — should really only be paired with black shoes. Ultimately, matching your shoes to your suit is not that complicated. And remember, your belt should always be the same color as your shoes.